A high adhesion, breathable, soft cloth medical adhesive tape for a range of challenging applications and when repeated taping is necessary. The same soft, latex-free, hypoallergenic, conformable tape as standard Medipore™ tape, but with increased gentleness and stronger adhesion for more challenging applications. Suggested application: Securing over areas where skin may stretch, such as edema, distention, hematoma formation or movement. Skin Care Condition Type: Peri-Tube Skin Irritation, Tracheostomy Site Trauma, Trauma from Tapes and Dressings. 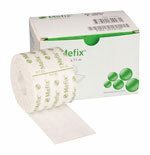 Hypoallergenic occlusive tape with an impermeable transparent polyethylene film backing to protect wounds from moisture, fluid & bacteria when used for short-term fixation of dressings. Transparent to allow easy skin monitoring. Cohesive, elastic conforming bandages specifically designed to facilitate all kinds of dressing retention. Breathable fabric with a special double adhesive effect means that the bandage sticks to itself, but not to skin. 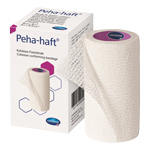 85% extensibility with a high absorption capacity due to a high number of natural fibres, the bandage consists of 40% Cotton, 30% Viscose and 30% Polyamide. 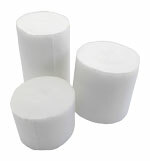 Light weight foam bandage designed for use underneath adhesive strappings and plaster casts to absorb moisture and prevent chafing and hair loss. A support bandage used to aid venous and lymphatic return in the management of venous disorders of the legs and arms. May also be used as an undercast stockinette in cast bracing, for support following cast removal, and to provide pressure therapy in the treatment of post-burn scarring. Provides lasting, effective support, while allowing complete freedom of movement, its radial stretch provides full support without slipping down.